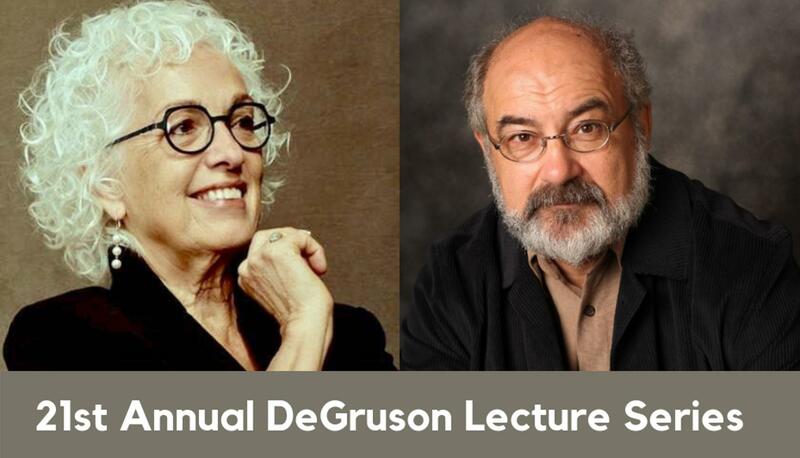 This year’s 21st Annual Gene DeGruson Memorial Lecture will be unusual. It will include two full days of presentations by award-winning authors and a combination of activities and demonstrations involving several departments across campus. The Gene DeGruson Memorial Lecture honors the memory of Gene DeGruson, a well-known scholar, writer, and editor who founded the Pittsburg State University Special Collections Department in 1968 and for 29 years built it into a treasure trove of artifacts and documents. DeGruson died in 1997. The memorial lecture is set to occur near the time of DeGruson's birthday, which was Oct. 10. Merilyn Simonds, author of 18 books and a finalist for the Governor General’s Award, and Wayne Grady, who has written more than 14 works of non-fiction, will headline this year’s event. Grady’s most recent book, “Up From Freedom,” is a powerful and emotional novel about the dangers that arise when people stay silent in the face of prejudice or are complicit in its development. His non-fiction work, “Bringing Back the Dodo,” is a thought-provoking read about how the forces of evolution and extinction have shaped the living world, and the part that humans play therein. Grady will present “Styles and Strategies: Making Nature Writing Appealing,” from 11 a.m. to noon in The Writing Center in Axe Library. At 2 p.m. he and Simonds will present “Literature Beyond Borders: Coffee and Readings with Merilyn and Wayne” in the Axe Grind in Axe Library. From 4 to 6 p.m., PSU alumna Cat Jepson, a designer and founder of The Seventh Journey and the Cat Jepson Letterpress Studio, will conduct a hands-on letterpress workshop and provide a demonstration of the book-making process in Porter Hall Room 201A, home to the Art Department. From 2 to 3 p.m., Simonds will present “The Forking of Paths of New Publishing: Conversations & Conundrums,” in Room E101 at the Kansas Technology Center, home to the College of Technology. In particular, the talk will explore digital printing and e-publishing. From 6 to 6:30 p.m., a reception will be held for the exhibit “Pressure From the Past,” featuring the Kennedy Whitesitt and Gene DeGruson Collections, in the Second Floor Gallery in Porter Hall. The exhibit, which opened Oct. 22 and will be on display through Nov. 27, was curated by Museum Studies Interns Shawna Witherspoon and Ellen Long, with assistance from Steve Cox, PSU Library Special Collections Archivist. It represents the history of printing at PSU and in Southeast Kansas and illustrates the impact that the invention of the movable type printing press preserved by PSU had on the region. Also from 6 to 6:30 p.m., Jepson will have on display a collection of handmade book samples created with a letterpress. At 7 p.m., Simonds will deliver the Gene DeGruson Memorial Lecture in the Governors Room of the Overman Student Center. She will discuss her book, “Gutenberg’s Fingerprints,” which explores society’s relationship to books and the digitization of reading. A reception will follow. The lecture and other activities are sponsored by PSU Library Services, the departments of Art, History, Philosophy, and Social Sciences, Teaching and Leadership, and English & Modern Languages, the Center for Teaching and Learning Technology, the Kansas Technology Center, Dr. Jim and Dr. Penny Armstrong, The Raven Bookstore, the Canada Council for the Arts, and the University of British Columbia.